1. Why could not I log in my account? If you did not sign up on Voogueme before, your user name and password are both the email address on your order. You can use your email address to log in your account. 2. Can I change my password? Yes, you can reset your password after login in your account, or contact our Customer Service Center to change your password. If you didn’t register, your password would be your email address by default. If you have already registered and forgot your password, you can click “forgot your password” to reset your password or you can ask our Customer Service Center for help. If you want our Customer Service Center to help you reset your password, you can give us a password you want to use and then we help you reset or we can help you reset firstly and then tell you the new password if you want. 1.How do I get my prescription? A: Voogueme does not provide eye test for glasses. Please visit your ophthalmologist or optometrist to obtain both an eye test and a prescription. They are legally obliged to provide you with a copy of your prescription. Make sure you ask them if they do not give you. Please also ask your doctor to measure and record your pupillary distance (or PD) on your prescription. Your PD is the distance in millimeters between the centers of your pupils. Your PD is not always included in your prescription, but it is very helpful for us when making your glasses to make sure that they fit you perfectly. A: The abbreviations and numbers on your prescription may look unfathomable, but it's really a kind of medical shorthand-a professional's way of telling a laboratory what's needed to correct your vision. RIGHT EYE (OD) OD = Oculus Dexter in Latin, or right eye. LEFT EYE (OS) OS = Oculus Sinister in Latin, or left eye. BINOCULAR Binocular = both eyes. On your prescription, your pupillary distance may be a binocular PD (one number for both eyes) or a monocular PD (one number for each eye). SPH or RX SPH = Sphere or spherical correction describes the horizontal curve of your eye's lens. Sphere is assigned a positive (+) or negative (-) number between -10 and +10. And sphere is the lens power that it takes to focus an image on your retina correctly. A single-vision eyeglass prescription without astigmatism lists only SPH. CYL = Cylinder or cylindrical correction fine tunes for astigmatism-the vertical curve of an eye shaped more like a football than a sphere. Astigmatism is very common. Cylinder is a positive (+) or negative (-) number between -6 and +6. Your prescription may or may not have a CYL number. AXIS = the degree and direction of astigmatism. If you have a CYL number indicated on your prescription, you'll also have an AXIS measurement. It's a positive (+) number between 0 and 180, sometimes preceded by an "x". A single-vision eyeglass prescription with astigmatism lists values for SPH, CYL, and AXIS. 3.How often should I have my eye tested? A: According to Practitioners' Services, your recommended intervals between eye tests vary depending on your age and health. 1.How do I know if the frame size fits me? Different frames are in different sizes, while you can find the sizes details above the description. Or you can use the "Advanced Search" to find the one that best suits you by filling in the frame width, lenses height, etc. Before this, you can refer to your previous glasses, check the inside of the temple arm and there may be some numbers there. The first number is lens width, the second is bridge, the third is temple. If you can not find the numbers on the inside of your frame, you can always try measuring by hand. And then choose frames with same or similar figures. 2. Will the size be biased? The size may have a difference less than 2mm due to the difference of angle and the measuring tool. 3. What are the best frames for my face shape? 4. Is there a way to try on your frames and see which ones fit me best? Of course, you can use the “try on” function on our website to see how it looks on your face. (1) If you are using a computer to browse our website now, the “try on” button on the top left of the product image, click it and then upload your picture! (2) If you are using your smart phone to browse our website now, the “try on” button on the bottom right of the product image. 5. What frames can be ordered as sunglasses? As for the frames, all of our frames can be ordered as sunglasses, except for some clip-on sets. As for the lenses, we’re really sorry to tell you that the progressive lenses can’t be made as sunglasses, while photochromic lenses can. 6.What should I do if the frame I prefer is out of stock? You can contact with our agent and they will tell you the approximate date when they will be back in stock. 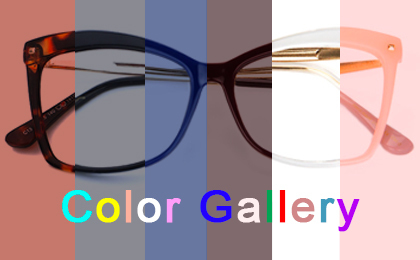 Or click the “Notice Arrival”, you can fill in your email address, and we'll email you when the frames restock. 1. What does the Lenses Index numbers mean? The Lens Index number (1.51, 1.57, 1.61, 1.67, or 1.74) refers to the degree of refraction the lens provides. This means how much the light that enters the lens is refracted (bent) as it passes through the lens. Lens Index is also related to the thickness of the lens. The higher the index, the thinner the lens will be. People with higher prescriptions should choose high-index lenses. 2. Can I fill strong prescriptions? Certainly. The single vision prescription can be made as 1.74 High-Index lenses. The SPH can be made from -20.00 ~ +12.00. You can contact our customer service if you want to know the strong prescriptions in detail. 3. I ordered the progressive lenses, why is there only one ADD value on my prescription? Even there is only one ADD value for progressive glasses, it applies to both lenses. 4. How do I order Readers / Magnification? Firstly, choose the frames you prefer. Then, click the button " Select Lens" to choose your prescription type as "Readers" and then just choose the strength. 5. What is the difference between Photochromic and Polarized lenses? Photochromic lenses are clear indoors and darken when exposed to sunlight. Polarized lenses are glare-reducing, tinted lenses for sunglasses. And Polarized lenses are great for driving, as well as water and snow activities. 6. Can I fill prescriptions with prism corrections? Of course. You can choose “Single Vision” and then choose your Prism Corrections. 7. What if my prescription has expired? We strongly recommend that you get an eye exam every two years, or more frequently if you notice that your vision has changed. 8. Can I use my contact lenses prescription to order glasses? We’re very sorry to tell you that a contact lenses Rx only can be used for contact lenses. 9. How to add the prescription on my frame only ordered? You can place a new order with your prescription, and contact our Customer Service Center to inform us. Then we can refund the price of the frames and ship the lenses for you. We now accept PayPal, Credit and Debit Card. 2. How to get a coupon? If it is your first shopping on our website, we will offer a $3 coupon for you. We also send promotional email to customers. What’s more, you can follow our website to check the new special offer. Of course, you can be a follower of Facebook and we have a lot of activities on it. 3. If I didn’t use the coupon in my order, what should I do? We can refund the coupon amount to your account, if you tell us after placing the order within 24h. 4. May I have a discount if I do not want the free gifts? We are afraid not. The free gifts are just our best wishes, and the most important thing is that you are satisfied with our products. 1. Why did not I get my order confirmation email or shipping notification email? Our emails are sometimes grouped as Ads. You may check your spam folder or trash box to look for the email. Please be sure your email address matches the one on your order. If you still can not find the email, you may contact our Customer Service Center to send a new email. 2. If I want to change my prescription or address, what should I do? ① You can call us, our customer service telephone is +1-(619)-738-6660. ② You can chat with us on LiveChat. ③ You can send the email to support@voogueme.com within 1~2 workdays when you placed you order. We will reply you as soon as possible and send the confirmation to you! 3. How can I cancel an order? If you put in a wrong prescription, you can contact with us and we can change the information for you. You needn’t cancel it in this condition. If you just want to cancel the order, you can also contact us to cancel it for you. 1. What’s the scope of your delivery? Our delivery is worldwide. Wherever you want it to be delivered, we can do it for you. Yes. We offer free shipping worldwide on condition that your order is over $59. First, you can track your order with your order number or shipment number filled in the bar TRACK ORDER on the top right corner of our site; Then, you can also contact our customer service representative to help you track your package. 4. Why is there no update of my package? For the international shipping, it is normal that there might not be timely update of your package and please wait patiently. If there is no update of your order over two weeks, please contact Voogueme and the Express Company to track your package. 5. What should I do if I'm not satisfied with my eyeglasses? Contact us via e-mail at support@voogueme.com within 30 days from the day you receive your eyeglasses. Package your glasses securely and leave a note including your name, order number and a brief note describing the returning reasons. We will refund you soon after we check the package we received. For more information, please refer to our Return & Refund policy. Note: All returns must be returned in their unworn, original condition. 6. How do you handle shipping delays? Generally speaking, the express is very stable and fast, which would ship to you on time. We kindly remind you to enter your shipping address correctly. Shipping delay occurs for unpredictable reasons, such as weather, custom safety inspection etc. Please don' t worry, we are responsible for logistics problems and won' t let you bear the loss. If your order has no shipping tracking information updated for a long time, please feel free to contact us . Don’t worry please. We will check it for you. If your order is confirmed to be lost (after ensure that tracking information shows ‘delivered’, the shipping address is correct, and you have contacted with local courier and got no news). We will remake and redeliver freely for you.